Islamofascism and anti-fascism in the Arab world during World War II. 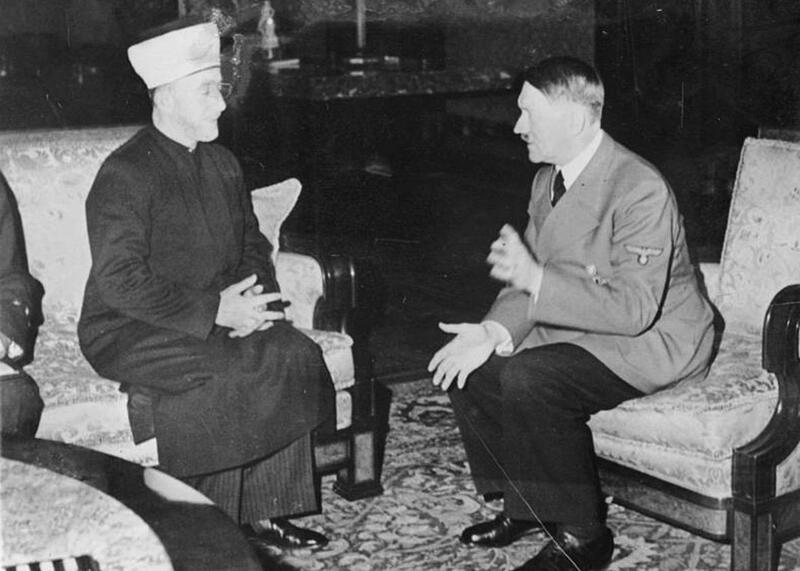 Did the Muslim World Really Fall for Hitler? A famous photo suggests that fascism was popular in the Middle East during World War II. The history says otherwise. Amin al-Husseini with Adolf Hitler. This photo has had an extraordinary life for an archival document. It remains a fixture on anti-Muslim websites, and an anti-Muslim group paid to have it plastered on buses in several U.S. cities in 2014. Recently, the man on the left—Amin al-Husseini (1895-1974)—made headlines when the prime minister of Israel falsely credited him with giving Hitler the idea for the Final Solution—a suggestion for which the prime minister was roundly rebuked by genuine scholars from around the world, including Israel. But the photo certainly seems to suggest a connection between al-Husseini and Hitler. Is this where the notion of “Islamofascism”—still a popular term with some Western commentators—originated? Born into a prominent Jerusalem family during the period of Ottoman rule, al-Husseini later worked to oust the Ottomans as a recruiter for the British and for anti-Ottoman Arab rebels during the First World War. After the Ottoman Empire was dissolved, al-Husseini joined the movement for a self-governing Arab federation of nations in the Middle East. There was reason to hope: The British had promised Arab independence after the war in exchange for their help. When, in 1920, Arab leaders declared an independent kingdom centered on what is today Syria and Lebanon, a jubilant al-Husseini rushed to join them in Damascus. But the French had always planned on keeping Syria and Lebanon for themselves after the war, and bombed the upstart kingdom to dust. Al-Husseini then returned to Palestine to work toward self-rule there. But the British, too, meant to keep the region for themselves after the war, arranging for the League of Nations to grant them a “mandate” in Palestine. (This was a euphemistic term for a colony, meant to connote a humanitarian objective.) The British also wanted to support the creation of a “national home”—a phrase they strategically left undefined—for Jewish people in the region. But after years of appealing to the British for an independent Palestinian nation without success, al-Husseini started to reject his mainly political means for armed ones. In the later 1930s, he helped lead a revolt in Mandate Palestine against the British. That uprising flashed briefly before the sluggish British Empire turned, redirected its great weight, flooded the country with soldiers, and brutally expunged the rebellion in scenes reminiscent of the terroristic anti-Irish counterinsurgency of the early 1920s. Husseini fled Palestine for Lebanon. With war between Germany and Britain from 1939, al-Husseini saw an opportunity to work with the enemy of his enemy. He moved to Baghdad to foment anti-British action in Iraq, which was nominally independent, but where in fact the British maintained bases and controlled the oil sector. Germany, meanwhile, readily lined his pockets while making inflated promises to political leaders willing to side with al-Husseini and the Reich. In 1941, with the U.S. still on the war’s sidelines and Britain on its heels, several Iraqi generals and politicians decided with al-Husseini to throw their lot in with the seemingly invincible Axis, sparking a coup against Iraq’s pro-British government. Suddenly, Germany seemed on the cusp of gaining a key ally at a key moment in 1941 with a large, modern army and vast oil supplies. But the attempt failed—in large part thanks to the quick response of Muslim units from the British Indian Army and Britain-allied Jordan—and al-Husseini and his co-conspirators ran to Berlin. From there, al-Husseini urged Muslims to resist the Allies—even calling for a holy war. But despite his title of “Mufti,” he was in no special position to do so and could not command a large body of followers. He was one of many competing to be recognized by Germany as a future pan-Arabian leader, which led al-Husseini to make extraordinary claims about his influence among Muslims, respect for Hitler, and race-hatred for Jews. It was thus a triumph when he had this photo taken with the Führer himself in late 1941. Naturally, this sort of nefarious thing gets repeated by those who make a case for “Islamofascism.” But the idea that Islam has historically harbored an innate affinity for fascism has been roundly discredited by scholars. It’s a “highly ideologically loaded political term” that lacks an historical basis, writes Rene Wildangel. It’s “an epithet” for “splitting off Islam” from the rest of the world, says Islamic scholar Reinhard Schulze. And professor and former president of the Middle Eastern Studies Association Joel Beinin calls the juxtaposition “crude” and “tendentious.” The only solid piece of evidence for the extent to which Middle Eastern Arabs listened to Nazi propaganda like al-Husseini’s suggests it was massively unpopular. While there were certainly influential Iraqis who threw their lot in with Nazi Germany, there were also Iraqi activists who argued that, for all Britain’s meddling, it could not be compared with Nazi Germany’s “animal” aggression. And should Britain fall as France did, they added, there would be nothing to stop fascist colonialism over the globe. In Egypt, there was some support for Germany, but a broad current of anti-Nazism as well, with a number of newspapers railing against Nazi inhumanity and Mussolini’s brutalities in North Africa. Palestine’s predominant nationalist Arab newspaper, Filastin, was anti-Germany from well before the war. Muslim leaders in Britain, meanwhile, also argued that Islam was the natural ally of democracy. Muhammad Najati Sidqi was born in Jerusalem. He first worked for the British Mandate’s civil service, then studied in Moscow in his 20s as a committed socialist before returning home to become a leftist journalist. Throughout the 1930s, he read the words of Hitler, Goebbels, and Rosenberg and watched the unfolding nightmare of Germany, which he visited in 1936. While some communist comrades held their noses and supported Stalin’s rapprochement with Hitler in 1939, a disgusted Sidqi broke with them and international communism. His fierce anti-Nazism brooked no expediencies. The early basis of Sidqi’s book was a series of radio broadcasts and speeches he had made in Spain as a participant in the Spanish Civil War. There, Franco’s fascist-supported nationalist forces used Muslim Moroccan soldiers in their fight against the democratically elected Republican forces. Sidqi’s job was to try to turn these Moroccans to the democratic side. So, he pleaded—sometimes shouting from trench to trench—that Islam and fascism were diametrically opposed. His book captured the essence of Nazism with a shrewdness equal to that of any thinker in the world. The foundation of Nazism, Sidqi understood, was racism. For the rulers of Germany, “Aryan racism is an absolute truth of life, a supreme spiritual principle … that is the origin of everything, the basis of the culture and the foundation of the spirit.” Aryan blood, the purity of which had to be jealously defended, placed the Germans above all others in a global hierarchy that placed the English, French, and Americans in the middle place, and Africans, Arabs, Indians, and Jews at the bottom. So—just as in Europe, the U.S., India, and even Britain—in Arab lands there were those who were seduced by fascism and Nazism or sought to profit from it, and others, like Sidqi, who saw past its temptations. It should come as no surprise that the contest between democracy and anti-democratic authoritarianism in the Middle East continues today.